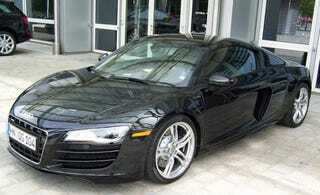 We've seen a lot of the 2009 Audi R8 V10 since breaking the first pics and providing video of it running last month. But now we get an unblemished look from Autoweek.nl at the new hotness from the four rings in all its re-powered glory. The new R8, with it's 5.2 liter V10, flared-out side-blade, and modified nose is definitely swoon-worthy, as evidenced by these unbelievably clean shots apparently snapped outside of Quattro GmbH in Germany. We can't wait to see the times this thing posts on the Nurburgring.